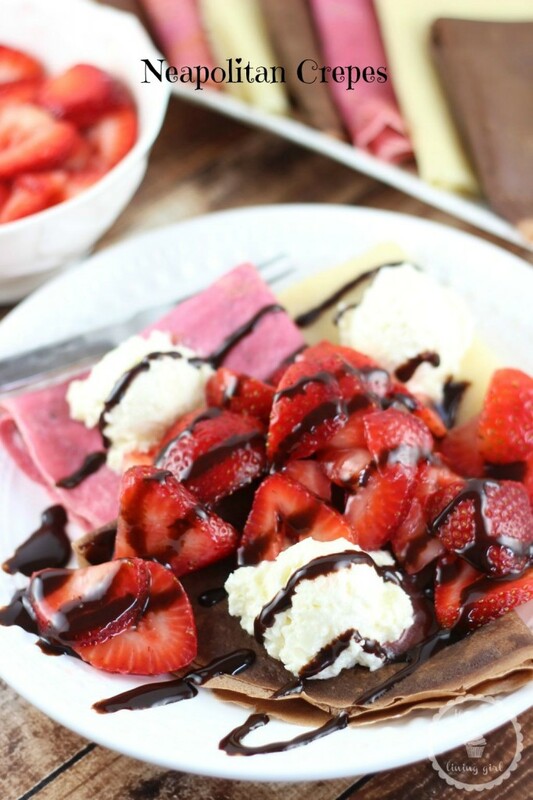 A trio of chocolate, vanilla, and strawberry crepes, with a sweet vanilla Mascarpone filling, and topped with strawberry sauce and chocolate syrup! I had a brilliant (read: decent) idea. When I went on the crepe binge a few months ago (it hasn’t really stopped, btw, I just stopped talking about them to give you all a break), I was determined to make a crepe cake. They are so fancy and elegant. Time consuming, yes, but on the surface, they seem worth the effort. Crepe cakes really impress. And in my limited experience, they’re also fantastic. How could they not be? You really can’t go wrong stacking up 30+ buttery, crispy, and carby crepes, then slathering frosting in between each layer. That’s just amazing. The inventor of the crepe cake deserves a medal. Not just for the invention alone, but because crepe cakes are sooooooooooo hard. Labor-intensive, time-consuming, and also…. temperamental. Unless it’s just me, which is admittedly a good possibility. I set out to make a crepe cake, but not just any crepe cake, this one was a Neapolitan crepe cake, made with a trio of chocolate, vanilla, and strawberry crepes. Best idea EVER. Maybe not ever, but probably one of the better ideas I’ll personally have. Or was it? Um, NO. The only thing harder than making all the crepes for hours on end was the actual assembly. With my first attempt, I used cream cheese frosting. I had only stacked about 4 or 5 together when the cream cheese frosting turned watery and started to separate. I have no idea why this happened. I tried to complete the cake as fast as I could, but it still kept separating and the crepes were sliding all over the place. I threw it in the freezer overnight and stood vigil. This kinda worked to salvage it, but this recipe technically failed and I can’t give you a failure. The second attempt (yes, during a window of pure insanity, I endeavored this project again!) failed in the same fashion. I tried a different kind of frosting this time around, I can’t even remember what because I probably blocked it out of my mind, but it went downhill the same way. So much wateriness and separation. I cannot understand it. So devastating. My current stance on crepe cakes: never again. 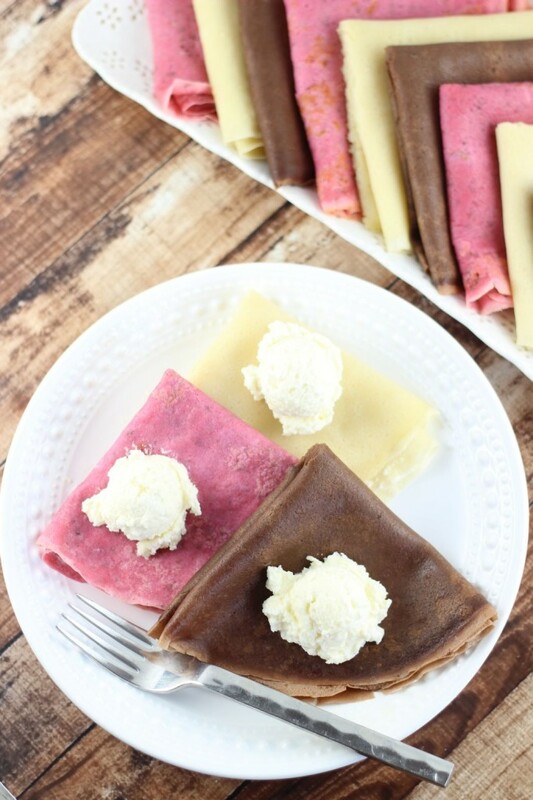 In the end, we can still combine the idea of Neapolitan and crepes though, so at least there’s that. You only need to mix up one large batch of vanilla crepe batter, and you’ll divide it up. To one portion, you simply add pureed strawberries. To a second portion, a little cocoa powder. To the third portion, nothing. It’s not too labor intensive! The filling is a sweetened vanilla Mascarpone fluffed up and airy from the addition of whipped heavy cream. It’s rich and creamy, but not overly sweet. As if this were a legit sundae, I dressed it up with little dollops of the Mascarpone filling to resemble ice cream scoops, as well as a topping of fresh macerated strawberries, and a drizzle of chocolate sauce. 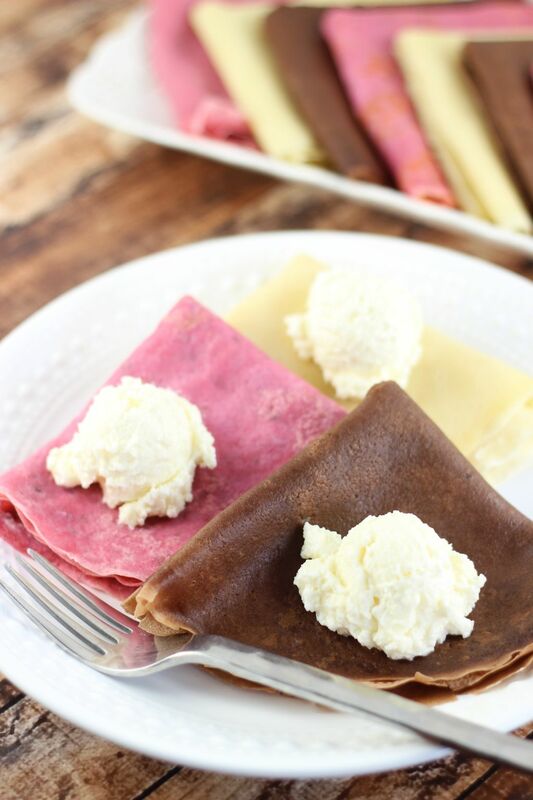 No shortage of Neapolitan flavor here in these crepes. A delightful trio of chocolate, vanilla, and strawberry flavors, and… they’re pretty too. 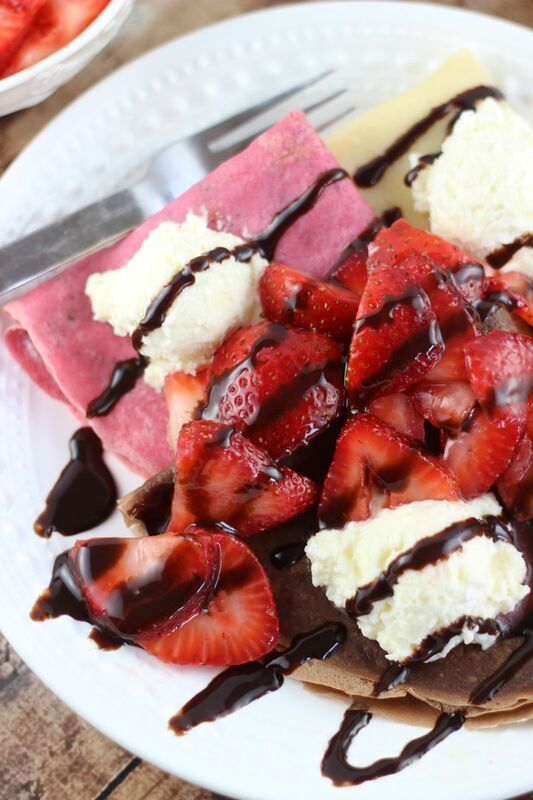 A trio of chocolate, vanilla, and strawberry crepes, filled with sweet Mascarpone, and topped with fresh strawberry sauce! In a medium bowl, combine strawberries and sugar. Allow to macerate for about 20-30 minutes. In a large bowl, combine eggs, milk, water, flour, melted butter, sugar, and vanilla. Whisk vigorously until smooth. Divide the crepe batter evenly into 3 bowls. One of the bowls will be vanilla crepes and won't need additional ingredients. Set it aside. Add 1/3 c. pureed strawberries to one of the remaining bowls, and whisk til smooth. Add 2 tbsp. cocoa powder to the last remaining bowl, and whisk til smooth. 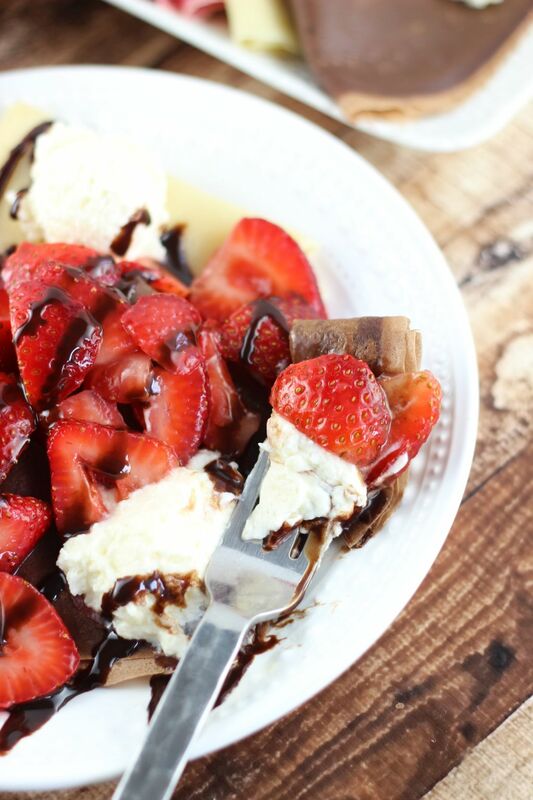 You'll have a bowl for vanilla, strawberry, and chocolate crepes. Each will make about 4 crepes. 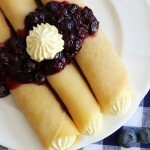 Remove crepe from pan, and continue making crepes with remaining batters. In a large mixing bowl, beat heavy cream and powdered sugar until it forms soft peaks, about 3-5 minutes. Fold the Mascarpone into the heavy cream mixture. 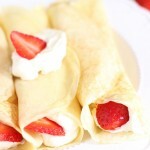 Spread a small amount of Mascarpone filling on each crepe. Fold the crepes into quarters. 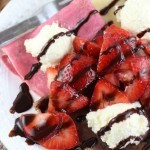 Arrange one vanilla, one strawberry, and one chocolate crepe onto each plate. Using a spoon or cookie scoop, drop a tablespoonful of Mascarpone on top of each crepe. 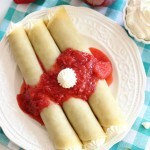 Serve with fresh strawberry sauce and a drizzle of chocolate sauce, if desired. Best of all, they didn’t fail miserably. Yay! Yes, it was a terrible pain. Never again… until next time! Haha. No, seriously – never again. 🙂 Thanks, Manali! I LOVE this idea! I haven’t tried a crepe cake yet either… too intimidating! Yep, at least I was able to partly salvage the idea. Never making a crepe cake again! 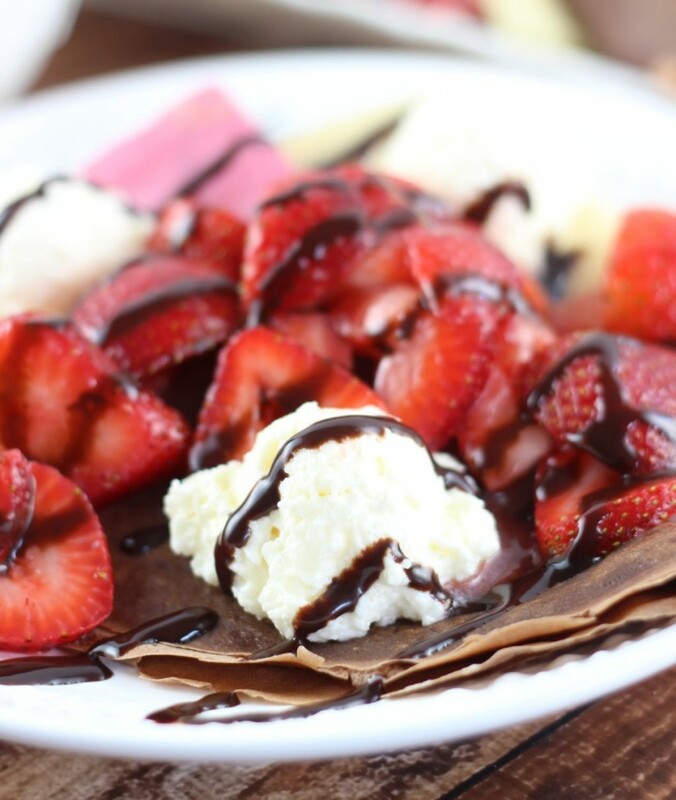 These crepes look incredible…who needs a cake anyway?! Pinned! I applaud you for your efforts! 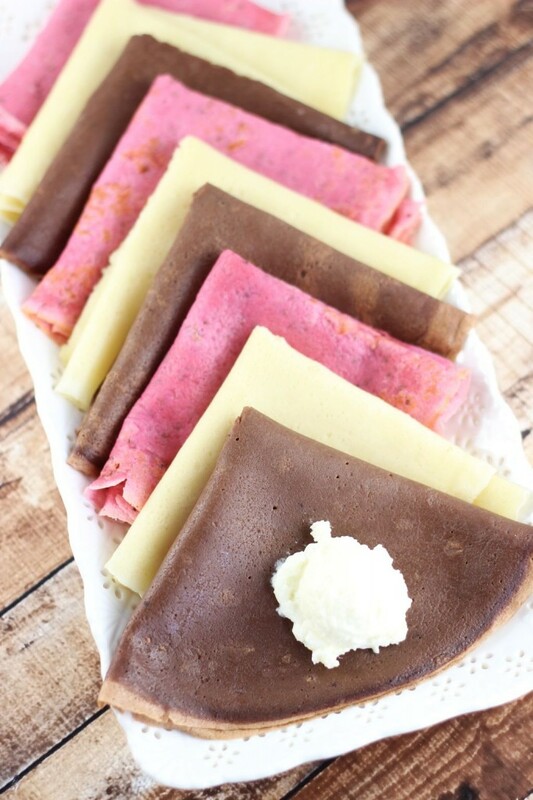 Even though the cake didn’t work you, you still managed to produce gorgeously colored crepes. They look delicious and need to be on my plate for breakfast right now! Whoa! What a labor intensive endeavor! And a bummer it didn’t work out! The end result sure did turn out gorgeous though! 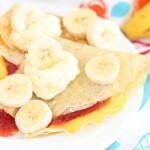 These crepes sound absolutely amazing! They are so beautiful in all of those colors too! These crepes are gorgeous, Sarah!! 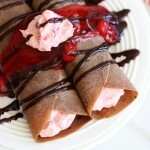 Sorry your crepe cakes didn’t turn out, I love the Neapolitan flavors you had in mind! I had trouble with mine in the beginning too. I decided to let the crepes cool completely before filling them and made a thicker buttercream frosting. I think yours look super delicious still and the colors are so so pretty! I had the crepes refrigerated, so I wonder if they formed condensation as they cooled? I don’t know, but your crepe cake was GORGEOUS!! !